Corruption and Bribery Will Destroy Our Nation – Elzar Shariah Solution & Advisory Sdn. Bhd. Bribe is wealth earned by accomplishing a task for a party that should have been done without any compensation (whether to bring benefit to the party or to avoid harm). In some situations, bribery is similar to tips or rewards and distorted by some people who say that ‘this is not bribery, but a reward’. 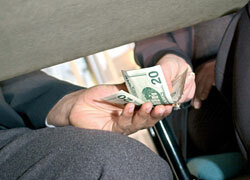 Any persons or agents that offer/give/agree to give a bribe (money/ items/services etc.) as a motivator or reward to perform or not to perform any related transaction or related to a formal transaction, principal/employer. Any person who gives to an agent, or an agent gives to his principal/ employer, a document that he/she knows or realizes contains forged information, which is important to the principal/employer, with the intention of deceiving his/her principal/employer. Any public sector executive that use their title and position to receive bribery for any decisions or actions related to himself, where the executive, his relatives or his cronies have an interest in directly or indirectly. 3) A narration mentions that Rasulullah s.a.w. sent Abdullah Rawahah to Khaibar (Domain of the Jews that was under Islamic authority) to value the dates from the district since Rasulullah s.a.w. has decided that the revenue of Khaibar should be divided into two; half for the Jews and the other half for Muslims. “The gifts given to the enforcer are suht (haram) and the bribery received by a judge is kufur” (Narrated by Ahmad). Call it bribe or gift; both are obviously haram in Islam. All wealth gained from bribery is haram, to keep them is haram and to expense them is haram. Hence, every receiver, giver and middleman involved in this haram activity must be punished, and the punishment for them is ta’zir. Heavy ta’zir has to be imposed on these individuals as a lesson to them and to discourage other Muslims. Nowadays, without the application of the Islamic uqubat system, we can see people who are involved in bribery still smiling and looking so calm while facing trial in court. They feel no guilt or worry for the despicable things that they have done. According to Islamic law, an individual who knows is obligated to report it to the authoritative bodies. If not, he is considered abetting and will bear the sin as well. Hiding or letting this epidemic continue will have a negative effect on Islam, corporations, organizations and the country. In the end, all will be exposed and eventually collapse. 1) Does not have written evidence or if he has, the document is private and confidential (P&C). If he reports it, he will instead, be charged with the Official Secrets Act (OSA). This problem should be reviewed by the authoritaties if they are really serious in fighting bribery. 2) Sympathy, because they are friends or close acquaintances. To those involved, remember that you will also bear the sin of abetting. 3) A “don’t care” attitude. This is also considered sinful in Islam. 4) Too lazy to go to court. Rightly, there should not be laziness in fighting what is wrong and evil. This is an indication of a weak iman. 5) Worried that it will backfire if the whistleblower is not protected. Authorities must ensure protection or no one will come forward. 6) No confidence in the authoritative bodies. Concerned that the authoritative bodies will be bribed and the whistleblower is charged instead. The authoritative bodies need to earn the public’s confidence. 7) Anxious because the individuals involved in bribery is well connected and powerful. These are indications of a country awaiting its destruction. 1) Easy ticket to hell. For Muslims especially, bribery will ease the path to hell. 2) Obliterate fairness in society. Protection of wealth, dignity, life and self cannot be insured. All can be bought. 3) Producing an incompetent society. The number competent, skilful and knowledgeable people will decline as skills have no more meaning. The skill to bribe is more important. 4) Selfish society. Individuals will only think about themselves without the negative effects on the victims in the short term and to the country in the long-run. 5) Producing poor quality work. It threatens safety and peace. A job granted due to bribery exposes the public to danger due to low quality of work/construction. 6) Increase in management cost. New entrepreneurs will face expansion problems due to cost of bribery. 7) Slow response and management. People will delay a task to wait for higher bribes. Approvals may take longer if the executives at each level desire bribes before processing an application etc. Hence, to those who feed his family with bribery, without sincere taubat, Allah s.w.t. may plant the opportunity for his children to follow his footsteps that will eventually annihilate the family. 9) Imbalance in the distribution of wealth. The rich will become richer and the poor will become poorer. The poor will face enormous difficulties in improving their lives since they have no ‘connections’, and not enough money. Islamic Banking Financing Rate not competitive ? Mohd Zaimy bin Abdul Latiff on Returns On Islamic Account Competitive?